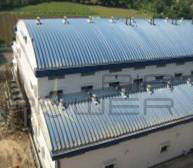 Structureless roofing system, Round shed, Roofing Sheet, Roofing Sheets manufacturer in Gujarat, India. "SAVING UP TO 50% OF CONSTRUCTION TIME OF THE SLAB AND ROOF." 2. Girder less – Wide – Clear span up to 36 Mts. 5. Installation of 1000 Sq. mtrs. in just 12 hrs. 11. Inter locked sheets prevents holes in roof – caused by bolts & hooks. 12. Using very special material alloy of 55% aluminum & 45% zinc. its give high Corrosion resistant. WHY GO WITH INDO-TECH ROOFING.? WE WILL PROVIDE PROPER TECHNICAL SUPPORT & SATISFACTION. Sky lights :- Sky lights made from poly carbonate/FRP sheets can be fitted on top of the roofing system to provide sufficient day light to the interiors. “AIR-POWER” AIR VENTILATOR :- “AIR-POWER” brand air ventilator made from aluminum or stainless steel (as per requirement) run on wind energy provide fresh air and day light, removing hot air, smoke humidity & gas fumes. And create pleasant atmosphere to the interiors. Hangers :- Hangers can be easily inserted into the roofing for suspending cable trays, false ceiling and lighting fixtures.